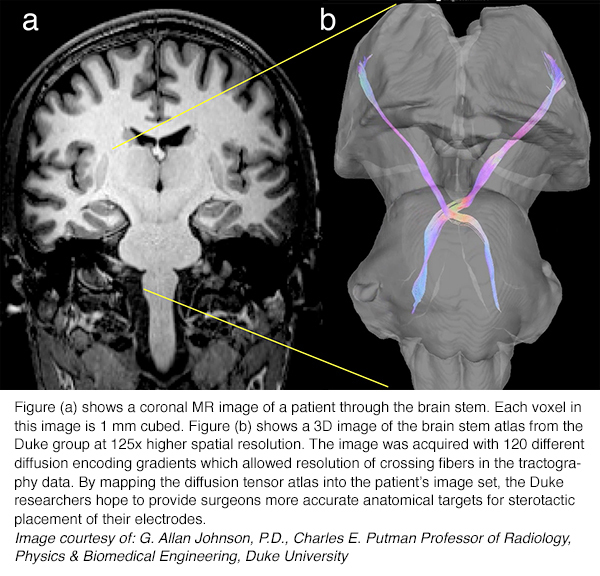 A team of radiologists, neurologists, neurosurgeons and pathologists at Duke University Medical Center in Durham, NC, have created a detailed 3D map of the human brain stem from images acquired by a 7 Tesla small bore laboratory MRI system. The level of detail shows the thalamus and its underlying circuitry and could minimize the risk of implanting electrodes in the brain used for deep brain simulation (DBS) treatment of patients with tremors and Parkinson’s disease. The highly detailed images were obtained at the Duke Center for In Vivo Microscopy during 10 days of scanning a healthy donor’s postmortem brain stem using a 7.0 Tesla Magnex Scientific small animal MR scanner which is controlled with an Agilent console. RF transmission and reception were achieved with a 65-mm inner-diameter quadrature RF coil. The brain stem specimen was imaged using high-resolution gradient echo and diffusion MRI protocols. The images, 1,000 times more detailed than a clinical MRI image, were used to create a 3D model that can be proportionately scaled to fit a patient’s unique brain anatomy using a high-performance computing cluster. “On a conventional MRI exam performed before surgery, the thalamus looks like a gray mass where you can only see the borders,” commented neurosurgeon Shivanand P. Lad, M.D., Ph.D., director of the Duke NeuroOutcomes Center. The images show nerve fibers in the brain, how they are crossing, and the subtleties of contrast between gray and white matter in the brain, according to G. Allan Johnson, director of the Duke Center for In Vivo Microscopy in the Department of Radiology. He explained that today many neurosurgeons rely on CT and MRI scans and geographic coordinates relative to the planes of the brain to guide them when placing electrodes into the thalamus. The neurosurgeons are targeting a circuit called the dentatorubrothalamic tract (DRT), which is displayed as an X-shaped pathway. Lack of detail of available CT and/or MRI images makes implanting electrodes imprecise. Surgeons may need to remove and reinsert electrodes and test frequencies to find the locations inside the thalamus where an electric current can subdue the tremors of a patient. While indirect targeting is the current standard of care for DBS, the risk of placing/removing and re-placing electrodes in the brain can cause complications that include hemorrhage, seizure, or memory problems. To test the accuracy of the model, the researchers conducted a retrospective study of 12 patients who had already been treated successfully for tremors using DBS. The researchers used the 3D model to predict the best placement for the electrodes in each patient. The predictive computer model and the actual successful electrode placements correlated for 22 or 24 electrodes. Their findings were published online June 3, 2015 in Human Brain Mapping. The next study to be undertaken is a prospective study using the 3D model to guide DBS surgery. The researchers will also perform 7 T MRI imaging of other circuits in the brain, the brain stem, and the spinal cord to develop new treatments for other conditions. They hope to explore applications for treatments of Alzheimer’s disease, neuropathic pain, depression, and potentially obsessive compulsive disorders. Calabrese E, Hickey P, Hulette C et al. Postmortem diffusion MRI of the human brainstem and thalamus for deep brain stimulator electrode localization. Human Brain Mapping (DOI:10.1002/hbm.22836) Published online June 3, 2015. Vision of the future: creating precision 3-D model of human brain stem using 7 Tesla MRI images . Appl Radiol.